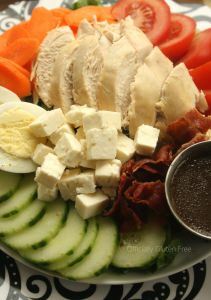 This Delicious Chef Salad is made with Chicken, Bacon and Feta Cheese. It’s topped with Carrots, Cucumber, Tomatoes and a Hard Boiled Egg and is served with a side of Balsamic Dressing. 1. Cook the chicken and bacon and hard boil a few eggs. 2. Wash and chop, then plate your lettuce. Then slice up and pile the rest of the ingredients on top.